More and more event venues are insisting on a Printed Marquee Engineering Certificate. We can provide this. 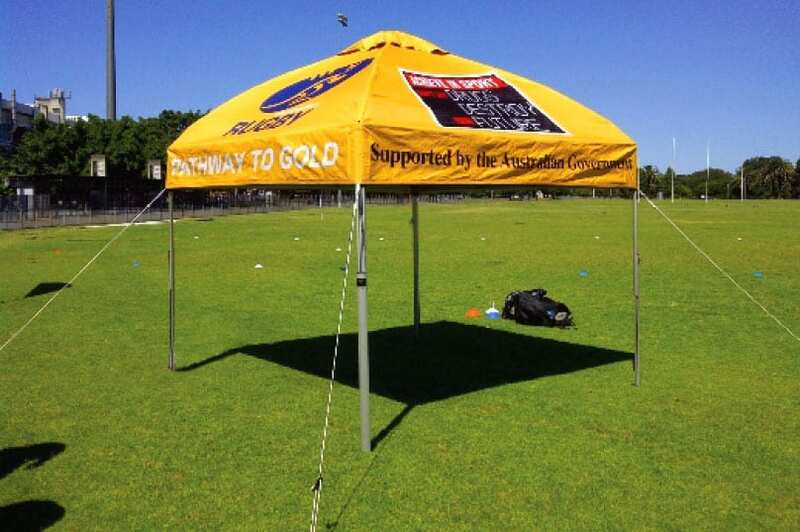 Event venues across Australia now require that engineering certification be shown for Printed Marquees before they are allowed to be erected on site. What is a Printed Marquee Engineering Certificate? This important document provides upper wind strength limits for the minimum weight or peg requirements. This certificate is required by event venues to ensure the safety and quality of the branding equipment being used. What does this mean? To further explain, the table below highlights the main points that can be found on a printed Marquee Engineering Certificate. 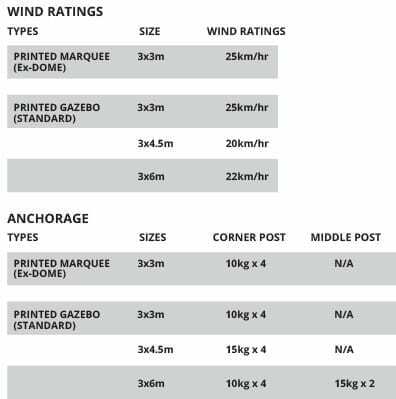 The wind ratings listed assume that the printed marquees have the minimum weight specified in the anchorage section on each corner. The quality of our printed Marquees is�assured.�We are able to provide a�detailed printed Marquee Engineering Certificate�for our Printed Ex-Dome Marquees, and Standard Printed Gazebos. This reduces the time spent tracking one down on event day. The wind ratings listed above assume that the printed marquees have the minimum weight specified in the anchorage section on each corner. For ultimate safety at your event we recommend using both weights and the tie downs whenever possible. On a regular dry grass surface the documentation recommends a peg at least 400mm long. The image featured right�shows a printed marquee with the tie downs set up.�The tie downs do not need to be set so far out if space is tight. The ropes can even go straight down the legs and attach to the pegs placed next to or through the feet. This also reduces the tripping hazard. Visit our Printed Marquees product page. View our Printed Marquees gallery page.